UPDATE: On April 12, 2017, the Azerbaijani court ruled to uphold the two-year prison sentence of Mehman Huseynov on charges of defamation. On March 3, 2017, a Baku court sentenced Azerbaijani human rights activist Mehman Huseynov to two years in prison on “defamation” charges. He is the Chairman of the Institute for Reporters’ Freedom and Safety (IRFS), an Azerbaijani organization promoting freedom of expression. Three days before receiving his sentence, Mehman produced and shared a video about the appointment of Mehriban Aliyeva, Azerbaijani President Ilham Aliyev’s wife to the office of First Vice President. The video features Mehman asking passersby if they would also appoint their wife to a vice president position if they were a leader of a company. Mehman has documented the deteriorating political freedoms in Azerbaijan through powerful photographs that captured the world’s attention, and received the Norwegian Nobel Institute’s Press Prize. In 2012, the World Youth Movement for Democracy selected Mehman’s powerful photograph of Azerbaijani police brutality against citizens as a winner in the “Youth in Action: a Snapshot of Democracy” contest. The photojournalist’s brave reporting has made him a frequent target of extreme state-sponsored harassment, including arrests, travel bans, interrogations and assaults. Nearly two months before his imprisonment, unidentified policemen abducted and tortured Mehman. The next day, January 10, 2017, Nasimi District Police fined Mehman for “disobeying the police.” Sadly, in Azerbaijan, this is part of a larger pattern of repression of the free press. The previous head of IRFS, Azerbaijani journalist Rasim Aliyev, served as Chairman until his tragic death on August 9, 2015. Unknown attackers murdered the influential journalist during a brutal crackdown on Azerbaijan’s civil society. Mehman’s brother, and IRFS founder Emin Huseynov has also been a target of severe police harassment. The European Court of Human Rights found that the Nasimi District Police were guilty of torturing Emin two years ago, before he fled Azerbaijan due to intense state-sponsored harassment. In October 2015, Emin received asylum in Switzerland, where he now resides. Several international civil society organizations have condemned the attacks against Azerbaijani activists such as the Huseynov brothers, and mobilized to build international pressure on the Azerbaijani government. On March 9, 2017, the Extractive Industries Transparency Initiative (EITI) suspended the membership of Azerbaijan for its violation of the EITI’s human rights standards. Earlier that week, human rights NGOs, Azerbaijani activists, and the UN Special Rapporteur on freedoms of assembly and of association discussed Mehman’s arrest and human rights in Azerbaijan at an event entitled “Azerbaijan: Continued Repression of Civil Society and Human Rights Defenders” in Geneva, Switzerland. A representative of the Republic of Azerbaijan to the UN Office and other International Organizations in Geneva criticizedMehman at the event, and accused the award winning journalist of belonging to the lazy “Facebook generation.” The Azerbaijani media outlet SANCAQ live streamed the event, which can be viewed here. On January 16, 2017, leading members of Azerbaijani civil society issued a public letter urging the Parliamentary Assembly of the Council of Europe (PACE) to respond to human rights violations in Azerbaijan. The letter asked for a reinstatement of a special rapporteur on political prisoners in Azerbaijan, the appointment of an ethical commission to the Council, and an independent investigation into allegations of corruption in PACE. Shortly after the letter was published, the current President of PACE Pedro Agramunt called upon Azerbaijani authorities to releasepolitical prisoner and leader of the Republican Alternative Movement (REAL) Ilgar Mammadov. Mehman now joins Ilgar and at least 119 other political prisoners, who are behind bars because they expressed dissent in Azerbaijan. 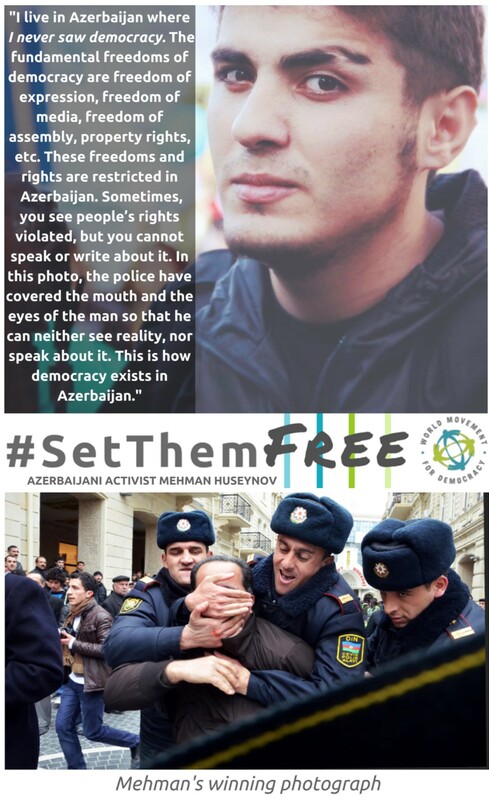 The World Movement for Democracy is alarmed by the ongoing attacks against Azerbaijani civil society, and the wrongful imprisonment of Mehman. Click here to join us in calling for the immediate and unconditional release of Mehman Huseynov by sharing this solidarity tweet!